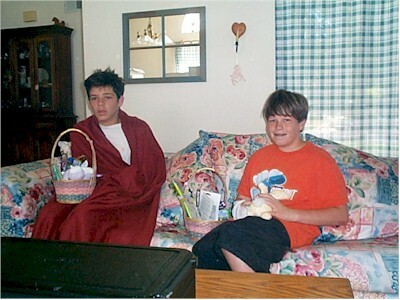 Easter Sunday has always been fun for Matt and Scott. They look for plastic eggs all over the house. Needless to say, it was Scott (who looks far more "awake" in this photo) who got the majority of the eggs this year. Not that it really matters in the end anyway. Later, we had a nice Easter dinner on the picnic table in our back yard.